Follow the direction for Sugar Cookies or Powdered Sugar Cookies, making the filling while the dough is chilling. If the cookie cutter you choose is not symmetrical, lay half of the dough cutouts upside down on the cookie sheet before baking, so that you'll have matched sets of cookies. Bake and cool as directed in the recipe. If you'd like to use this to fill a layer cake, increase the amount of jam to 1/2 cup and stir it into the entire amount of ganache. 1. Heat the cream in a small saucepan over medium until scalded (watch carefully, as it can quickly boil over). Add the chocolate, turn the stove off, and let sit for 3 to 4 minutes. Stir until the chocolate is completely melted and incorporated. The ganache should have the consistency of pudding. Pour about one third of the ganache into a small bowl and stir the jam into the remaining ganache. Let the plain ganache cool until just slightly warm and set the raspberry flavored ganache in the refrigerator to firm up. 2. Separated the baked cookies into matching pairs (a top and a bottom). 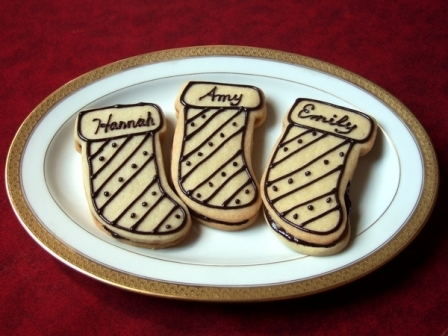 Fill a small pastry bag with a small round tip with the plain ganache and use to decorate the "top" cookies. Spread about a tablespoon of the raspberry ganache on the flat (underneath) side of the "bottom" cookies, then sandwich together.